With this information in hand, we will proceed to examine the pertinent verses of Scriptures with the intent to uncover Yahweh’s truth of the matter. The method of our investigation that will be utilized is as follows: the relevant verses of the narrative will be given in the form of two texts with their respective English translations.—1.) Hebrew Masoretic Text (BHS) and 2.) Targum Onkelos (TGO). We have utilized late second century C.E. Aramaic text called Targum Onkelos for the purpose of providing a text that has retained the name Yahweh in the form of a circumlocution consisting of the Hebrew letters יוי. Why then would the scribes use the circumlocution יוי (Yahweh) if the original had eloahim or some other substitute? All indications are that the scribes of this Aramaic edition followed a Masoretic text which used Yahweh at those places where the sacred name was eliminated . This detail clearly indicates that the original Masoretic text had the name Yahweh where this text differs with Targum Onkelos. There will be emphasis given with all caps along with red type as needed. Other notations will be explained as we go along. Also, As required, after each relevant verse, an explanation for clarity. As you will notice, some verses are self explanatory and will need no comment. And YAHWEH APPEARED UNTO HIM (ABRAHAM) in the plains of Mamre: and he sat in the tent door in the heat of the day. Then YAHWEH APPEARED TO HIM (ABRAHAM) at the plains of Mamre while he was sitting at the gate of the tent, while the day was hot. And he (Abraham) lift up his eyes and looked, and, lo, THREE MEN STOOD BY HIM: and when he saw them, he ran to meet them from the tent door, and bowed himself toward the ground. Then he (Abraham) lifted up his eyes and saw, and behold, THREE MEN WERE STANDING BY HIM. So he saw them and ran towards them from the gate of the tent, and bowed down to the ground. And said, MY SOVEREIGN, if now I have found favour in thy sight, pass not away, I pray thee, from thy servant. Then he said, YAHWEH, if now I have found mercy in your eyes, do not now pass by your servant. • Notice, according to Targum Onkelos, Abraham recognizes that at least one of the men is named Yahweh. And YAHWEH SAID UNTO ABRAHAM, Wherefore did Sarah laugh, saying, Shall I of a surety bear a child, which am old? Is any thing too hard for YAHWEH? At the time appointed I will return unto you, according to the time of life, and Sarah shall have a son. Then THE MEN STOOD UP from there and looked out over the face of Sodom. And Abraham was going with them to accompany them. And YAHWEH SAID, Shall I hide from Abraham that thing which I do. And YAHWEH SAID, Because the cry of Sodom and Gomorrah is great, and because their sin is very grievous. I (Yahweh) will go down now, and see whether they have done altogether according to the cry of it, which is come unto me; and if not, I (Yahweh) will know. I (Yahweh) will be revealed now, and I will judge if they have done according to their outcry that has come before me. I will totally destroy them. If they do not repent, I (Yahweh) will take vengeance. And THE MEN turned their faces from thence, and went toward Sodom: BUT ABRAHAM STOOD YET BEFORE YAHWEH. Then THE MEN turned from there and went to Sodom, WHILE ABRAHAM WAS STILL MINISTERING IN HIS PRAYER BEFORE YAHWEH. • Notice that one of the men named Yahweh stays behind to speak further with Abraham. And YAHWEH SAID, If I find in Sodom fifty righteous within the city, then I will spare all the place for their sakes. And Abraham answered and said, Behold now, I have taken upon me to speak UNTO THE SOVEREIGN, which am but dust and ashes. And he (Abraham) said unto him, Oh let not THE SOVEREIGN be angry, and I will speak: Peradventure there shall thirty be found there. And he said, I will not do it, if I find thirty there. And he said, Oh let not THE SOVEREIGN be angry, and I will speak yet but this once: Peradventure ten shall be found there. And he (Yahweh) said, I will not destroy it for ten’s sake. And YAHWEH went his way, as soon as he had left communing with Abraham: and Abraham returned unto his place. Then the glory of YAHWEH was taken up when he had finished speaking with Abraham, and Abraham returned to his place. • Notice that the male named Yahweh proceeds to Sodom some time after the other two men who had left earlier. AND THERE CAME TWO ANGELS TO SODOM AT EVEN; and Lot sat in the gate of Sodom: and Lot seeing them rose up to meet them; and he bowed himself with his face toward the ground. THEN THE TWO ANGELS ENTERED SODOM IN THE EVENING, as Lot was sitting in the gate of Sodom. Lot saw them and rose up toward them, and bowed down before them on the ground. • Notice that these two men are now identified as also being angels. These angels arrive before the other angel named Yahweh who had stayed behind talking with Abraham. But the men (angels) put forth their hand, and pulled Lot into the house to them, and shut to the door. Then the men (angels) stretched out their hand and brought Lot in to them, into the house, and they shut the door. And the men (angels) said unto Lot, Hast thou here any besides? son in law, and thy sons, and thy daughters, and whatsoever thou hast in the city, bring them out of this place. Then the men (angels) said to Lot, “How many more do you have here? A son-in-law, your sons, and your daughters, and all that you have in the city, bring out from the place. FOR WE (ANGELS) WILL DESTROY THIS PLACE, because the cry of them is waxen great BEFORE THE FACE OF YAHWEH; and YAHWEH HATH SENT US TO DESTROY IT. FOR WE (ANGELS) ARE GOING TO DESTROY THIS PLACE, for the outcry against them has multiplied BEFORE YAHWEH, and YAHWEH HAS SENT US TO DESTROY IT. • Carefully notice that these two men or angels are the ones who left for Sodom prior to the other angel who was speaking to Abraham. The angel who was speaking to Abraham carried the name Yahweh. Also, these two angels say that they were sent by Yahweh to destroy Sodom. This also indicates that, at minimum, one of these two angels will take part in the destruction of Sodom. Keep in mind, the other angel named Yahweh has not yet arrived. And Lot went out, and spake unto his sons in law, which married his daughters, and said, Up, get you out of this place; for YAHWEH WILL DESTROY THIS CITY. But he seemed as one that mocked unto his sons in law. Then Lot went out and spoke with his sons-in-law who had married his daughters, and he said, “Rise up, go out from this place, for YAHWEH IS GOING TO DESTROY THE CITY.” But it was as though he was joking in the eyes of his sons-in-law. Note that the number of angels now present is revealed in verse 16. And while he lingered, THE MEN (ANGELS) LAID HOLD UPON HIS (LOT’S) HAND, and upon the hand of HIS WIFE, and upon the hand of HIS TWO DAUGHTERS; YAHWEH being merciful unto him: and THEY BROUGHT HIM FORTH, and set him without the city. But he held back, so the men seized his hand, and the hand of his wife, and the hand of his two daughters, for YAHWEH had compassion on him, and HE BROUGHT HIM OUT and set him outside the city. • Note, it is readily apparent that when early morning appeared as stated in verse 15 that the angel named Yahweh who conversed with Abraham had already arrived. We see in verse 16 that the angel Yahweh had mercy on Lot and proceeded to bring him out from the city along with his family. And Lot said unto them, Oh, not so, MY SOVEREIGN. Then Lot said to them, “Please, YAHWEH. • Notice that according to Targum Onkelos that Lot is calling out to Yahweh among the men/angels. And he (Yahweh) said unto him, See, I have accepted you concerning this thing also, that I will not overthrow this city, for the which you hast spoken. Then he (Yahweh) said to him, “Behold, I will honor you even in this matter, so as not to overthrow the city that you have sought after. Haste thee, escape there; for I (Yahweh) cannot do any thing till you be come there. Therefore the name of the city was called Zoar. Hurry, escape there, for I (Yahweh) am not able to do anything until you go there.” Therefore they called the name of the city Zoar. Then YAHWEH RAINED UPON SODOM and upon Gomorrah brimstone and fire FROM YAHWEH OUT OF THE HEAVENS. 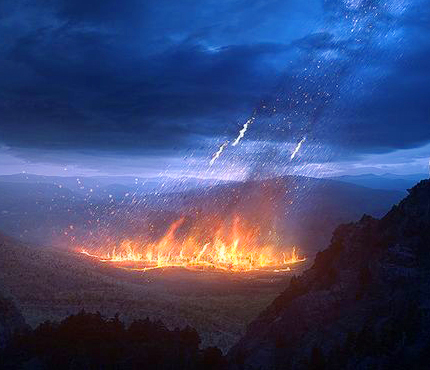 Then YAHWEH CAUSED TO RAIN UPON SODOM and Gomorrah brimstone and fire FROM BEFORE YAHWEH, FROM THE HEAVENS. Note, there can be no doubt that there is a Yahweh on earth calling for fire and brimstone from a Yahweh in the heavens. And he (Yahweh) overthrew those cities, and all the plain, and all the inhabitants of the cities, and that which grew upon the ground. Then he (Yahweh) overthrew these cities, and all the plain, and all the inhabitants of the cities, and the vegetation of the ground. And Abraham got up early in the morning to the place where he stood before YAHWEH. Then Abraham went early in the morning to the place where he ministered in his prayer before YAHWEH. Note that this verse is specifically stating that the person/angel that he was speaking to was named Yahweh! And it came to pass, when ELOAHIM DESTROYED the cities of the plain, that ELOAHIM REMEMBERED Abraham, and sent Lot out of the midst of the overthrow, when he overthrew the cities in the which Lot dwelt. Then it came about when YAHWEH DESTROYED the cities of the plain that YAHWEH REMEMBERED Abraham, and he sent Lot away from the midst of the overthrow, when he overthrew the cities where Lot was dwelling. Note that Targum Onkelos states that Yahweh destroyed the cities while the Masoretic Text has eloahim. Now here is where it becomes rather interesting. In Gen. 18:23, it is acknowledged that the one angel named Yahweh who was speaking with Abraham was going to destroy Sodom. In Gen. 19:13, it is clearly evident that THE TWO ANGELS, who had arrived prior to the other angel named Yahweh, say to Lot that YAHWEH HAD SENT THEM TO DESTROY SODOM. Keep in mind, Scriptures dictate that the one who sends out others is father Yahweh. Base upon this information it is clear that there are at least two angels who were involved in the destruction of Sodom and Gomorrah. One can be identified as an angel who arrived early and the other is the one specifically named Yahweh who remained behind to talk with Abraham. Then, in Gen. 19:15-18, early morning arrives and it seems that the angel named Yahweh was now present based upon Lot’s pleading with Yahweh himself. Finally, in Gen. 19:24, there can be no doubt that there is more than one personage named Yahweh who participated in the destruction of Sodom and Gomorrah. One is located on the earth, the other is located in the second or third heavens. Maybe it’s time to just think about it. This entry was posted on 10/10/2017, 5:31 pm and is filed under Angels, Archangel, Religion, Sodom and Gomorrah, Targum Onkelos, Yahweh. You can follow any responses to this entry through RSS 2.0. You can leave a response, or trackback from your own site.